Shopping | The Ack Attack! Threadless has a LOST shirt!! Awesome Lost collectibles over at Entertainment Earth!! 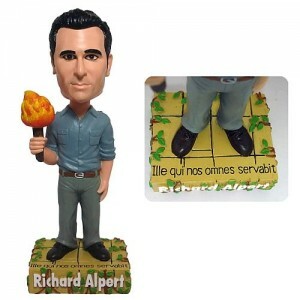 I definitely just bought myself this Richard bobblehead so I can stare at his luxurious lashes all day in my cubicle. Jears T-Shirts Now Available for Purchase!!!!! Yes friends, today is your lucky day!!! By simply CLICKING HERE you can buy all sorts of Jearstastic gear (designed by Yours Truly) for yourself and loved ones! T-shirts, hoodies, pins, magnets, tote bags – all of this and more can be yours! What better way to let friends/family/total strangers know that Jack Shephard’s ever present teardrops are YOUR constant!? While drinking my coffee and perusing the weekly circulars this morning I saw that starting tomorrow Target will have Seasons 1-4 of LOST for $17.99 and Season 5 for $22.99. Best Buy will have all 5 seasons on Blu-Ray on sale for $34.99 all week as well. We have 23 days left until 2/02!!!!!!! It’s time for some marathoning! I’m still only in Season 2. The horror! Just a reminder, if you’d like to be kept abreast (lol) of my various LOST-related updates, you can Become a fan on Facebook or Follow me on Twitter! Today’s Deal of the Day at Amazon is All 5 seasons of Lost for $73, which is INSANE. Unfortunately it looks like you have to buy them altogether, but I figured someone would want to know. It’s also Half-Blood Prince DVD Day! Christmas has come early haha. Amazon has this crazy Lost Season 5 Dharma Initiative Kit on sale today if anyone needs to do some Christmahanukwaanza shopping for any crazed fans and/or themselves. Those floppy disks are pretty cool. You are currently browsing the Shopping category at The Ack Attack!.